So yesterday I mentioned I got a tattoo. You didn't think I would leave it at that, did you? I started thinking about a tattoo back in December, during a pretty dark time. I was so upset and frustrated with all things infertility - and one of the ways I took solace was the open letter I wrote about being a warrior. (If you haven't read that post you really should). The word warrior kept resonating with me. I wanted something to physically take back my body - to make it mine again after being betrayed by it for years. I started thinking about a tattoo - and the word warrior kept re-surfacing. Words are my thing. After giving it some time (I didn't want this to be an emotional or hasty decision), I knew I wanted the word warrior to be represented in my tattoo - but I didn't want the word in English. 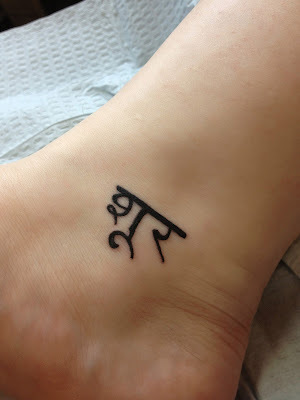 I thought a symbol would be tasteful and when I started thinking about other languages I decided on Sanskrit - the language of yoga. Yoga has been life-changing for me, as would this tattoo, and I loved the symbolism of it. I got some information from my yoga instructor and set about trying to choose a specific character. There were a lot of characters that translated into different meanings, but I wanted one that was as pure to warrior as possible - the one I settled on means "warrior" and "warrior for good." Last but not least, I had to decide where on my body I wanted this tattoo. The verdict? Inside of my right ankle. Surprisingly, this was the easiest part of the decision. I wanted it to be small, somewhere that wouldn't be too obvious, but where I could look down and see it. The contrast of the strength of the symbol with the delicate placement on my body made me love it even more. I emailed a few people who have experience with getting tattoos and took all their suggestions into consideration, but once I decided what I wanted to get, that was that. I took a recommendation from my sister about where to get my tattoo, and I couldn't have been happier. My artist was nice, easy to talk to, and incredibly talented. I got my tattoo on top of my ankle bone so there wasn't a lot of flesh to absorb the pain. It wasn't unbearable, but normally if I were doing something that hurt I would stop or shake it to take the stinging away, but I couldn't do that in this situation. So I stared out the window, squeezed Ben's hand, took deep breaths (yoga breathing FTW), and listened to the conversations Ben and my sister (Jen), were having to distract me. I love this picture. 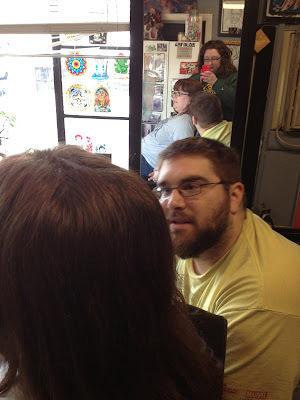 You can kind of see the face I'm making in the mirror, but I love how focused Ben is. Again - my artist was fabulous. It hurt, but it took her no more than ten minutes. I think partially because it was black ink and the tattoo was small, but also because she really is great at what she does. Me. With a tattoo. A warrior. Afterwards, my sister kept telling me how proud she was - she kept saying "you did so well! You did better than I did with my first 'bone' tattoo!" (Coming from someone who has a much higher pain tolerance than I do this was a fine compliment indeed). I've had people say they're happy I like it, but tattoos are not their thing. That's fine. Tattoos are not really my thing. But this is. It's perfect. I love it, and I don't need anyone else too. And during yoga, every time I'm in down dog, and see it, I get a huge grin on my face. People have told me tattoos are addicting and asked me if I'm ready for another one. I won't say it will never happen, (I never thought I would get a tattoo to begin with), but this was so meaningful and specific, it's hard for me to imagine having that again. I've always said if you have a tattoo you're a badass. Now I am officially in the club. Do you have any tattoos? Were you surprised you got them or is it something you always wanted? HI! Yes I have a tattoo. Four in fact. And yes I think it is addicting. I love yours and I think It is great that it has so much meaning to you. Welcome back by the way. I have missed your blog. I love that you're all like "Yea, I'm a badass" and there's a picture at the top of you signing the paperwork with a giant feathery pen. 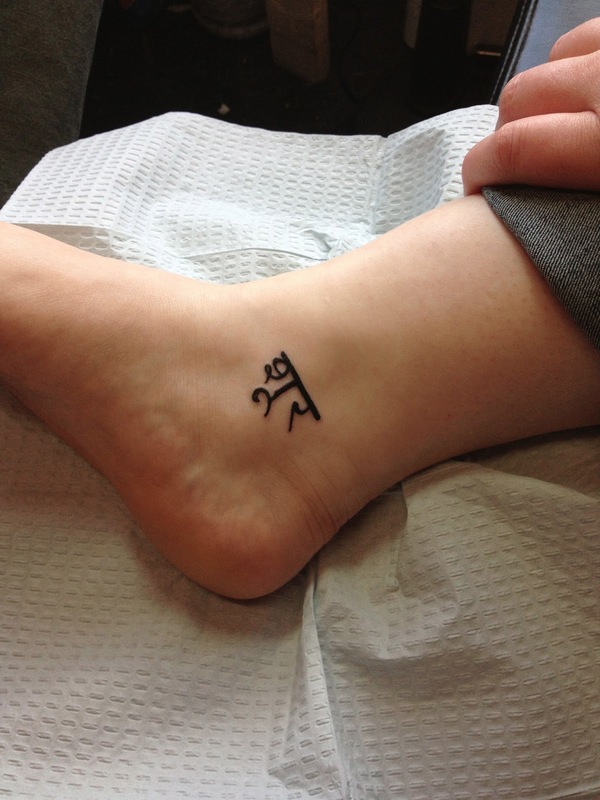 This is a wonderful story- I love the meaning that the tattoo has for you and that it makes you happy every time you are in downward dog- that is the best :) I don't have a tattoo myself. I've thought of getting one but I can't commit to anything in particular, or at least I couldn't when I was younger and now that I'm older I worry about my students seeing it and other stupid things that probably don't matter at all. Eric has 3 tattoos and I think he would be excited if I got one, so maybe someday! I LOVE that tattoo and the meaning it has for you! I have two tattoo's and feel kind of meh about both of them. I got them when I was pretty young! I do want to get another one one day though and would like it to be something really meaningful to me! I love that tattoo! I love how it expresses both your strength and your delicacy through the meaning of the tattoo and its placement. I am so happy that you are so happy with it, too. And I really like the tattoo placement because it is totally for you since it's in a place that many people won't see in day to day life. I don't have any tattoos and I doubt I will ever get one, but never say never! No tattoos for me (yet) but my brother makes up for that as he has eight, maybe nine now? =) I think tattoos are awesome and a great expression of who you are. Love what your tattoo is, means and stands for. I don't have a tattoo, because, well, they're not my thing. =) And, for a certain period of time, I had certain thoughts about people who do get tattoos (think: fringes of society or drunk frat/military boys). Then, Sweets and I started watching Miami Ink. We became fascinated with tattoos. Not enough to get our own. But, I now realize that every person has a story - and often their tattoos are a reflection of that. Becky, I love your story and your reasons for getting your tattoo. You most definitely are a member of the badass club!